Two police officers who moonlighted as private detectives have been convicted of bugging phones and hacking into computers on behalf of wealthy clients. Jeremy Young and Scott Gelsthorpe set up Active Investigation Services and ran a service dubbed "Hackers Are Us". One of their clients, waste millionaire Adrian Kirby, paid £47,000 for AIS to spy on environmental investigators. Gelsthorpe, of Kettering, Northants, and Young, of Ilford, east London, were convicted at Southwark Crown Court. 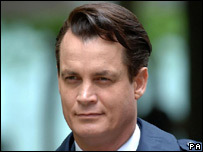 US millionaire Matthew Mellon was acquitted of spying on his ex-wife, Tamara, founder of the Jimmy Choo shoe company. Mellon, 43, from Belgravia, central London, was found not guilty of one charge of conspiracy to modify computer material. Gelsthorpe, 32, was convicted of two counts of conspiracy to cause unauthorised modification of computer material. He also admitted conspiring to defraud and cause criminal damage to property. Young, 39, had already pleaded guilty at the start of the trial to the same offences. Also convicted was David Carroll, 58, of Highgate, north London. But two other men - Daniel Carroll, 36, from Westminster, London, and Maurice Kennedy, 58, of Barnet, north London - were acquitted. In January, eight other men were sentenced after pleading guilty to conspiring to intercept phone calls or emails, or false accounting. Kirby, who is on the Sunday Times Rich List, was jailed for six months. 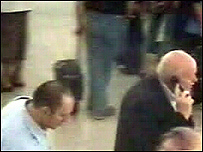 AIS was set up in August 1999 by Young and Gelsthorpe, who were both serving Metropolitan Police officers at the time. Gelsthorpe, who had been in the job for six years, was still on active duty while Young was on sick leave for depression throughout the time he was involved with AIS and only resigned after he was arrested. The pair made up fake names for themselves - Jamie Black and Sean Durney - to make their activities harder to trace. AIS offered many of the typical private investigation services including surveillance at £25 to £50 per man per hour. But they were dubbed "Hackers Are Us" in court for the "extras" they offered for a wealthy elite. They used illegal means to provide extra services for clients and had a price list for those services. For £5,000, AIS would "monitor" - or hack into - an e-mail account. For this, they used the expertise of Marc Caron, an IT specialist based in Phoenix, Arizona. He used so-called Trojan horses, which infiltrate computers through a seemingly innocuous e-mail, website or programme, but then allow hackers access to everything on the machine. Caron pleaded guilty in the US and will be sentenced on 28 June. 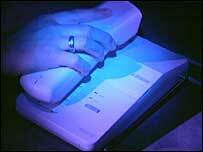 They could also tap a landline telephone at a cost of £6,000 per month. For this, they employed the services of Michael Hall. He was sentenced before this trial began after admitting a string of offences. AIS also used firms of "blaggers". Put simply, these were con artists who impersonated someone in a official capacity to trick information from a subject. On at least one occasion, AIS asked a blagger to pretend to be a doctor in order to glean personal medical histories. Gelsthorpe told the court that "seemed like fair play" to him. Clients varied. Some were individuals - often suspicious spouses. These were known as OTS enquiries - for "(A bit) On The Side". Others were companies. They included a multi-million pound waste disposal company, a transport company and a prestige bathroom firm. Subjects varied too and included local council officials and ordinary residents. Among the computers targeted were official networks in government offices. AIS was investigated by the Metropolitan Police's Anti-Corruption Command following a tip-off from BT. Then in July 2004 they began three months of intensive surveillance into what they called AIS's "corporate espionage". The firm's office was eventually raided on 29 September 2004 and a total of 27 people arrested. Police later realised AIS had been planning to expand operations to Ireland. Gelsthorpe denied all knowledge of the illegal activities. He claimed to be merely the office "gopher", but admitted paying no attention to legislation governing AIS's business practices. He told the court he took it on "blind faith" that nothing untoward was going on despite having underwritten the business. He denied knowing what Caron was up to on the other side of the Atlantic despite e-mails going to and from his account to Caron discussing computer hacking. Gelsthorpe blamed Young for everything. Young admitted breaking the law. His former receptionist Karen Coulson told the court he was a "good storyteller" who told lies and "would stretch the truth". Even his own wife did not trust him, Ms Coulson said. "When he wasn't in the office she would go through his things. She was pretty thorough, she wouldn't leave anything unturned. I knew she used to go through his e-mails, but she also found a SIM card hidden in a filing cabinet," she told the court. Detective Inspector Kevin Hyland, from the Metropolitan Police's Ant-Corruption Team, said: "This case has highlights the concerns law enforcement agencies have long held about the illegal activity undertaken by some members of the private investigation community which remains unregulated."